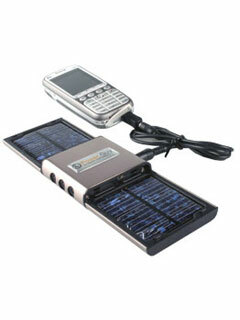 PowerGuy® SP1000 SOLAR Portable Power Pack with integrated Lithium Ion rechargeable battery! The PowerGuy® SP1000 is a mobile energy pack with built in Lithium-Ion battery rechargeable by Solar or USB! Also outside in the field, the SP1000 do not let you powerless. Simply remove the the two high efficiently photovoltaic solar cells,place them right and left side of the charger and your rechargeable battery will be charged with the power of the sun. It chrages and powers rechargeable batteries of mobile devices, as well as mobile phone, PDA`s, MP3Player and enables an energy supply system independent of the current power network. Solar Power again applicable and non-polluting. External SOLAR Power Supply based on built-In Lithium Ion batter; suitable to charge and for continuous operation of mobile phones, MP3 Player, MDA/ PDA Portable Playstation or Digicams.. The heart of all PowerGuy® is a special designed Chip which optimize charging current and efficiencyin order to deliver maximum charge to the battery. It starts up automatically when a device drawing current is connected at the output, enabling the immediate operation of the device even if the battery is fully depleted. In order to get it easy re-useable you can recharge it by SOLAR or via the USB cable connected to your PC or optional USB power supply. Output Volatge: 5.0 - 5.7V. Automatic startup when current drawn at output (upon connection to device). Automatic shutdown when no current drawn at output (10 second delay). rechargeable via USB of your Computer or optional Power supply.